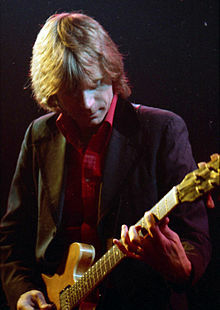 David William "Dave" Edmunds (born 15 April 1944) is a Welsh singer, guitarist and record producer. Although he is mainly associated with pub rock and new wave, having many hits in the 1970s and early 1980s, his natural leaning has always been towards 1950s style rock and roll. Edmunds was born in Cardiff. As a ten year old, he first played in 1954 with a band called the Edmunds Bros Duo with his older brother Geoff (born in 1940, Cardiff); this was a piano duo. Then the brothers were in the Stompers later called the Heartbeats formed around 1957 with Geoff on rhythm guitar, Dave on lead guitar, Denny Driscoll on lead vocals, Johnny Stark on drums and Ton Edwards on bass and Allan Galsworthy on rhythm. Then Dave and Geoff were in The 99ers along with scientist and writer Brian J. Ford. After that Dave Edmunds was in Crick Feather's Hill-Bill's formed in c 1960, with Feathers (Edmunds) on lead guitar; Zee Dolan on bass; Tennessee Tony on lead vocals; Tony Kees on piano and Hank Two Sticks on drums. The first group that Edmunds fronted was the Cardiff-based 1950s style rockabilly trio The Raiders formed in 1961, along with Brian 'Rockhouse' Davies on bass (born 15 January 1943, Cardiff) and Ken Collier on drums. Edmunds was the only constant member of the group, which later included bassist Mick Still, Bob 'Congo' Jones on drums and John Williams (stage name John David) on bass. The Raiders worked almost exclusively in the South Wales area. In 1966, after a short spell in a Parlophone recording band, the Image (1965–1966), with local drummer Tommy Riley, Edmunds shifted to a more blues-rock sound, reuniting with Congo Jones and bassist John Williams and adding second guitarist Mickey Gee to form the short lived Human Beans, a band that played mostly in London and on the UK university circuit. In 1967, the band recorded a cover of "Morning Dew" on the Columbia label, that failed to have any chart impact. After just eighteen months, the core of 'Human Beans' formed a new band called Love Sculpture that again reinstated Edmunds, Jones and Williams as a trio. Love Sculpture released their debut single "River to Another Day" in 1968. Their second single was a quasi-novelty Top 5, a reworking Khachaturian's classical piece "Sabre Dance" as a speed-crazed rock number, inspired by Keith Emerson's classical rearrangements. "Sabre Dance" became a hit after garnering the enthusiastic attention of British DJ John Peel, who was so impressed he played it twice in one programme on "Top Gear". The band issued two albums. After Love Sculpture split, Edmunds had a UK Christmas Number 1 single in 1970 with "I Hear You Knocking", a Smiley Lewis cover, which he came across while producing Shakin' Stevens and the Sunsets' first album entitled A Legend. The recording was the first release on Edmunds' manager's MAM Records label. This single also reached No. 4 in the US, making it Edmunds' biggest hit by far on either side of the Pond. It sold over three million copies, and was awarded a gold disc. Edmunds had intended to record Wilbert Harrison's "Let's Work Together", but when he was beaten to that song by Canned Heat, he adapted the arrangement he intended to use for it to "I Hear You Knocking", producing a highly original remake. Unfortunately, the success of the single caused EMI's Regal Zonophone Records to use an option that it had to claim Edmunds' album, 1972's Rockpile, and the momentum from the single's success on a different label went away. Edmunds' only acting role followed, as a band member in the David Essex movie Stardust. After learning the trade of producer, culminating in a couple of singles in the style of Phil Spector, "Baby I Love You" and "Born to Be with You", he became linked with the pub rock movement of the early 1970s, producing Brinsley Schwarz, Ducks Deluxe, and also the Flamin' Groovies, using a stripped down, grittier sound. Also in this time frame, Edmunds produced the 1972 debut album of the British blues band Foghat. Edmunds had bought a house in Rockfield, Monmouth, a few miles away from Charles and Kingsley Ward's Rockfield Studios where he became an almost permanent fixture for the next twenty years. His working regime involved arriving at the studio in the early evening and working through till well after dawn, usually locked in the building alone. Applying the layered Spector sound to his own productions it was not unusual for Edmunds to multilayer up to forty separately recorded guitar tracks into the mix. His own solo LP from 1975, Subtle as a Flying Mallet, was similar in style. The Brinsley Schwarz connection brought about a collaboration with Nick Lowe starting with this album, and in 1976 they formed the group Rockpile, with Billy Bremner and Terry Williams. Because Edmunds and Lowe signed to different record labels that year, they could not record as Rockpile until 1980, but many of their solo LPs (such as Lowe's Labour of Lust and Edmunds' own Repeat When Necessary) were group recordings. Edmunds had more UK hits during this time, including Elvis Costello's "Girls Talk", Nick Lowe's "I Knew the Bride", Hank DeVito's "Queen of Hearts" (written for Edmunds and later a US hit for Juice Newton using the same arrangement), Graham Parker's "Crawling from the Wreckage", and Melvin Endsley's "Singing the Blues" (originally a 1956 US Country No. 1 hit for Marty Robbins, then a US pop No. 1 cover for Guy Mitchell, and a UK No. 1 for both Mitchell and Tommy Steele). Edmunds' album Repeat When Necessary received a Silver Certification from the British Phonographic Industry on 20 March 1980 (for over 60,000 copies sold in the UK). The single "Girls Talk" also received a Silver Certificate from the BPI. Unexpectedly, after Rockpile released their first LP under their own name, Seconds of Pleasure (1980), the band split, generally attributed to tensions not between Edmunds and Lowe but between their respective managers. Edmunds and the band, including Lowe, performed in a music video for the track "Girls Talk", directed by Martin Pitts and produced by Derek Burbidge and Helen Pollack. For the video, the band set up on the roof of the Warner Brothers Records building in Midtown Manhattan in the early afternoon, causing a stir in offices in Rockefeller Center. Edmunds spent the 1980s collaborating with and producing an assortment of artists, from Paul McCartney to King Kurt, and from Stray Cats and Fabulous Thunderbirds to Status Quo. He was a big fan of Richmond Virginia pop rockers "Single Bullet Theory" and after the band signed with Nat Weiss's Nemporer Records he and the band were ready for Dave to take on the role of producer. Unfortunately for Single Bullet Theory the demise of Rockpile put their project on hold as Dave sorted through the Rockpile debris. The band and Dave did do a number of tour dates together but the record never got recorded at least by Dave; "Rob Freeman" of Go Go's fame was enlisted as producer for the group's freshman release "Keep it Tight". He recorded the soundtrack for Porky's Revenge!, supplying the main theme, "High School Nights," and was the musical director for a television special starring Carl Perkins, with assorted guests including George Harrison, Ringo Starr, and Rosanne Cash. In 1989 he produced the album Yo Frankie for Dion DiMucci. On his 1983 release, Information, Edmunds collaborated on two songs with Jeff Lynne, the leader of Electric Light Orchestra. One of these songs, a Lynne composition, "Slipping Away", became Edmunds' only other US Top 40 hit, albeit just barely, spending a single week at No. 39 while having a video clip in heavy rotation on MTV. It was not a hit in the UK. In 1984, Lynne produced six tracks on Edmunds' following album, Riff Raff. 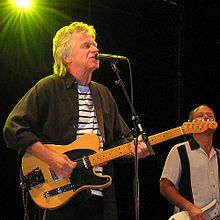 In late 1985, Dave Edmunds was the musical director of Carl Perkins's Rockabilly Session television special and a participating band member, to pay tribute to his hero. Other musicians involved in the project included George Harrison, Ringo Starr, and Eric Clapton. Edmunds recorded less frequently after the mid 1980s, living in Wales in semi-retirement, but occasionally touring. He joined up with Ringo Starr & His All-Starr Band for tours in 1992 and 2000. However, 2007 marked a return to touring for Edmunds, alongside Joe Brown, on a lengthy tour around the UK. He made an appearance on stage alongside Stray Cats, at the Brixton Academy in London, on 10 September 2008, playing "The Race Is On" and "Tear It Up" with the band. In 1993 Edmunds was in Cardiff Crown Court as a co-defendant along with Shakin' Stevens facing charges of non-payment of playing royalties from former Sunsets' band members Robert Llewellyn, Carl Petersen, Steve Percy and Paul Dolan. The prosecution asserted that the former band members were due a share of those additional royalties that Stevens and Edmunds had received from the successful reissue of the album A Legend during the early eighties. The judge agreed and, while the unpaid royalties only amounted to around £70,000 to be divided between the four musicians, the associated court costs to be paid by Stevens and Edmunds amounted to £500,000. On New Year's Eve 2008, he appeared on Jools Holland's annual Hootenanny, performing "Girls Talk" and "I Hear You Knocking". He was Holland's guest again at Borde Hill Garden on 20 June 2009, on 28 August at open-air concert at Carrickfergus Castle., 31 October at Ipswich Regent, 7 November at Stoke Victoria Hall and 14 November at Nottingham Concert Hall. Edmunds also played a five song set, including "I Hear You Knocking," "I Knew the Bride" and "Sabre Dance" with the Holland Big Band at the Royal Albert Hall on 27 November 2009. He returned and performed "Sabre Dance" on Jools' Annual Hootenanny on the 2009/10 edition. An album release on 19 November 2013 called ...Again, featured recordings from the 1990s, plus four brand new tracks; Edmunds' first for almost 20 years, with the title track released as a digital download single. Repeat When Necessary (June 1979) (UK No. 39, US #54)(Certified Silver in the United Kingdom 20 March 1980). ^ Erlewine, Stephen Thomas. Artist Biography by Stephen Thomas Erlewine at AllMusic. Retrieved 23 January 2016. ^ "Edmunds summary". Itsaboutmusic.com. Archived from the original on 15 April 2005. Retrieved 9 October 2011. ^ "BBC Edmunds Tribute". Bbc.co.uk. Archived from the original on 21 November 2003. Retrieved 9 October 2011. ^ "biography". Makingtime.co.uk. Retrieved 9 October 2011. ^ "The Human Beans : Single 1967 : Columbia DB 8230 : "Morning Dew (Take Me For A Walk)" / "It's A Wonder"". Webcitation.org\accessdate=2015-08-17. Archived from the original on 26 October 2009. ^ a b c Roberts, David (2006). British Hit Singles & Albums (19th ed.). London: Guinness World Records Limited. p. 179. ISBN 1-904994-10-5. ^ Murrells, Joseph (1978). The Book of Golden Discs (2nd ed.). London: Barrie and Jenkins Ltd. p. 278. ISBN 0-214-20512-6. ^ Edmunds also appeared in the Paul McCartney film, Give My Regards to Broad Street, but just as part of McCartney's backing band. ^ Chip Madinger & Mark Easter, Eight Arms To Hold You: The Solo Beatles Compendium (Chesterfield, MO: 44.1 Productions, 2000), 538, 570. ^ "Ents24.com". Ents24.com. 20 June 2009. Retrieved 9 October 2011. ^  Archived 18 October 2013 at the Wayback Machine. ^ Steffen Hung. "Dutch Charts". dutchcharts.nl. Retrieved 2015-08-16. ^ "Dave Edmunds - Here Comes The Weekend | Top 40". Top40.nl. Retrieved 2015-08-16. ^ a b "Certified Awards". Bpi.co.uk. Archived from the original on 6 February 2013. Retrieved 2015-08-16. ^ Steffen Hung. "Swedish Charts Portal". swedishcharts.com. Retrieved 2015-08-16.